Titanium. The chemical element with the symbol Ti and atomic number 22. A standard atomic weight of 47.867(1) and a hexagonal crystal structure, it is one of the finest elements the ultralight backpacker lusts after. Jetboil makes use of that fine material in order to produce the lightest, fastest and most efficient gas stove currently on the market. 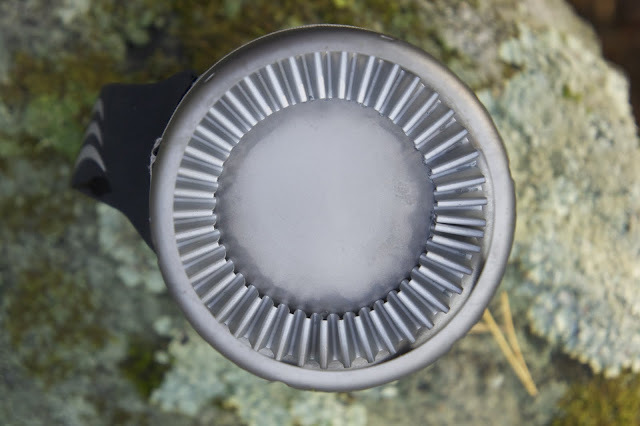 Webtogs asked me if I’d like to give the Jetboil Sol Ti some proper usage in nordic & arctic conditions. Looking for a good reason to try gas stoves yet again, and I having read a lot of positive stuff about Jetboil products in general I was delighted about the possibility to try this newest and lightest creation. Lets dive in this living review. I got the Sol Ti in mid August, and have so far only used it on day trips - this thus can be considered a rather detailed “first look”. I will update and annex the different sections over time. 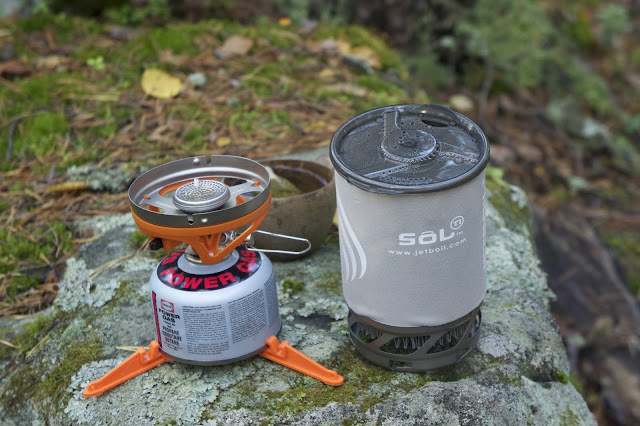 The Sol Ti is made to boil water. You can cook in it, but need to do so at the smallest flame possible and keep on stirring to minimize the risk of burning your food in the pot - personally I go for boiling water exclusively and pour it into a freezer bag for “cooking”. With that in mind, I can already say that the Sol Ti fulfills its function exquisitely, as it does boil water. Light, compact, efficient, fast is what I’d say are the main features. Of those four fast is of the least concern to me, though I won’t dismiss the merit of a fast stove in inclement conditions. But generally speaking, two or four or six minutes makes in a normal situation not much of a difference to me. Compactness on the other hand is something I value immensely. Going light has for me also a lot to do with decreasing the size of the gear, and this is where the Sol Ti really scores well. Being efficient means I don’t need to carry more canisters with me, and I should be able to get around 12 liters of boiling water out of one 100 gram canister - if I calculate with one liter a day (500 ml morning, 500 ml evening), this would mean twelve days before I run out of fuel. Not bad at all. And being light, obviously, is great. 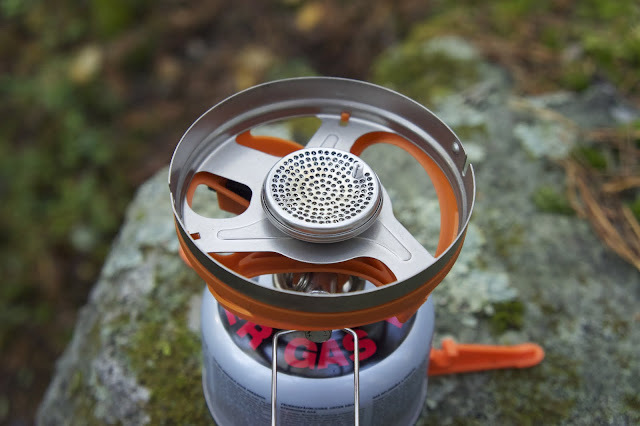 Jetboil says the features are the pour spout and strainer, the secure & easy pot connection, the fluxring, and the advanced igniter. Lets look at these in detail. A pour spout and strainer definitely are nice. They are both integrated into the lid, though - less of a deal with the strainer, but I feel a spout would have been nice as part of the pot itself - especially if once leaves the lid at home. I didn’t find any info online or in the instructions if the lid, made of a plastic of sorts, is BPA free, but Jetboil replied on Twitter that all their plastic is BPA free. The secure & easy pot connection is secure, but I wouldn’t say easy. It ain’t difficult, but easy is something like the MSR Reactor where I just put the pot on the burner and Voilá. With the Sol Ti putting the pot on the burner means you need to align the cut-out on the pot with the small bump on the burner and push them together until it feels secure. After that it is safe and sound, and shouldn’t fall off even if the complete unit tips over. Getting the pot off the burner after you have boiled water in it is a bit fiddly, but not a major obstacle. The Fluxring is a nice feature. It makes the Sol Ti very efficient - I used on average 4 grams of gas to boil 500 ml of water in under two minutes on my daytrips. I might try to compare it to a pot without a Fluxring to see how much efficiency it adds. The igniter also is a useful feature, as it means you don’t need to use your firesteel & puukko, a lighter or matches to get it on fire. No real innovations on the Sol Ti, if we don’t see minimizing weight to an absolute minimum as an innovation. Jetboil claims an “Increased Cold Weather Performance” - it not yet being anywhere close to 0°C I can not confirm that and it will need to wait till winter. 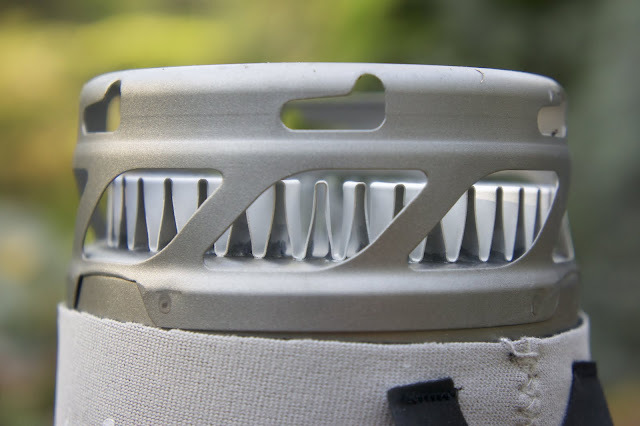 The “Fluxring” is Jetboil’s version of a heat exchanger with a fancier (or more confusing) name. It is nothing new, though, and also stoves made of titanium are hardly an innovation. Overall quality is solid. The pot sleeve is not cut and sewn very clean, but it is more a cosmetic than a functional matter. The pot is nicely made, though some users have experienced the development of a white powder between the fluxring and the pot bottom (The fluxring is made of Aluminium, while the rest of the pot is made of titanium - this can create problems with corrosion, see “What Others Say”). The Burner unit has the orange plastic ring-support-thingy around it, which holds the Piezo ignition. The black ignition button has about a millimeter of movement in its hold, and also the cable, while firmly in place, could somehow get damaged. I imagine if the complete unit would have been made of Titanium of Aluminum and would be enclosed (much like the Reactor unit) it would probably be similarly light (now the stove seems to be made from steel, not titanium). However, this is serious nitpicking - it really is very well made, and I have no doubt that it will have a long life. Easily the most important bit on an ultralight blog! TOTAL: 338 gram for everything. A UL backpacker would leave the pot bottom cup (minus 34 g), the pot support if he doesn’t use some other pot (minus 37 gram) and the canister tripod (minus 28 gram) at home, and would ponder if he really needs the pot lid (which would save another 18 gram). That would mean he’d carry only the burner unit, the pot & sleeve and the lid for a total of 239 gram. For a complete unit, if you want to be able to boil water fast & convenient, surely a great setup. A look at the Jetboil website shows there’s zero information on any sustainability efforts of the company. The Sol Ti itself is Made in China so will have quite a trip via ships, trucks, trains and plains behind it before it is in front of you. The packaging it comes in is compact and small, made of a clear PET plastic which can be (in Finland, don’t know how it is in your country) easily recycled. The papers and the packaging lack any information on if they’re printed on recycled/ FSC approved paper with soy inks et al. so it is save to think they’re most likely not. However, paper is easy to recycle in most countries. Aluminium and titanium can be recycled. 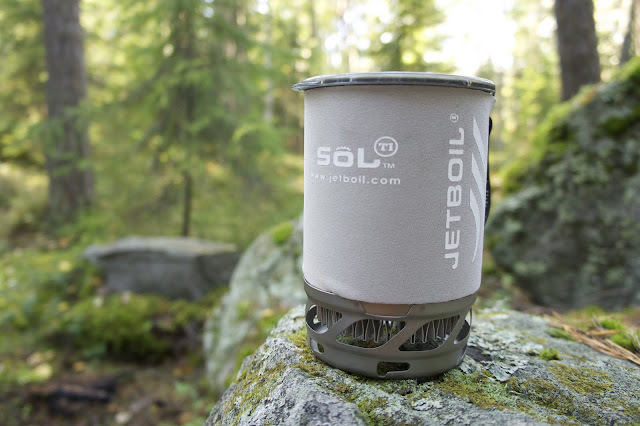 However, Jetboil has no info on this, or a recycle system in place. You might be able to recycle your Sol Ti either via a scrapyard or, if it is still in good condition, sell it onwards or trade it at a service like Swap.com. Paper and packaging which come with it can be easily recycled (in Finland). The big drawback of any gas stove is less the stove itself, but the gas canisters which are used. Now while Jetboil has a “Butane Canister Recycling Tool” I find this is just a mediocre solution. I still much more would prefer a refillable canister solution, which would save massive resources in terms of production, transportation and waste. 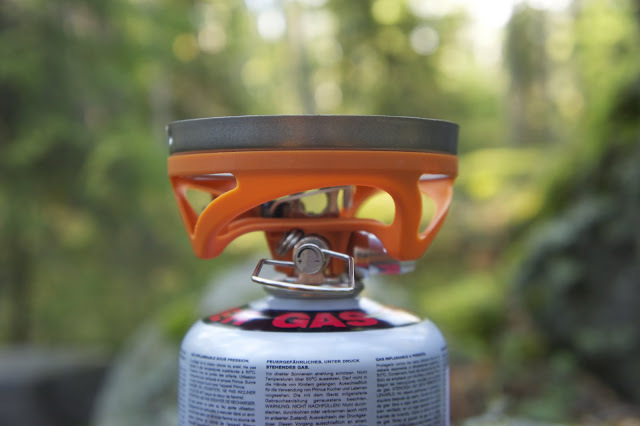 However, I think JetBoil, Primus, SnowPeak and all other gas canister manufacturers are not interested in innovating and are happy with the rather poor status quo. Anyhow. The Crunch It tool allows you to puncture butane canisters in a safe way and make them ready for recycling. It is a step in the right direction, though there are better solutions, as I outlined. 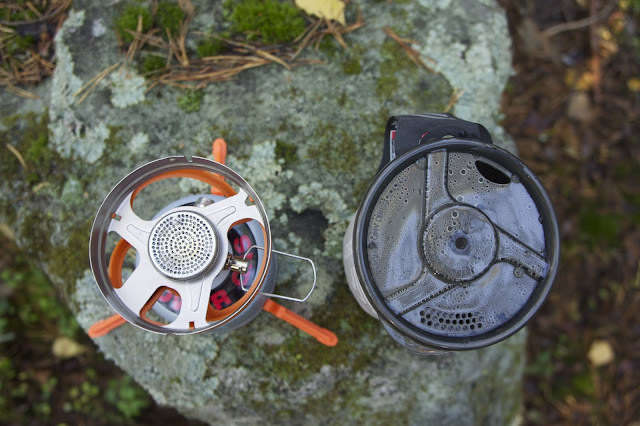 Besides Jetboil’s own stoves there’s a bunch of competeling products (practically every stove can be seen a competitor, but lets think systems here): The MSR Reactor and Optimus Crux Lite come to my mind, as they’re complete sets. If you open your mind a bit, then also the Backcountry Boiler and the Trail Designs Sidewinders can be considered competing problems. Of these I would consider the MSR Reactor the closest competitor. While being heavier it is has a higher volume (0,6 l for the Sol Ti versus 1,5 l for the Reactor) and is similarly efficient in its usage of gas and speed. I will do a video of them in the future to discuss them side-by-side; for now it is useful to point out similar systems. Roger found the Sol Ti a star on his Nordkalottleden trip. Colin reports some corrosion on his Sol Ti after using it on the Colorado Trail. On my daytrips, many of them in inclement weather, I was very happy about the convenience and fast speed of the stove. All in all you can have a hot beverage in about four minutes from taking it out of your pack to a steaming hot cup of tea in your hand. I was equally impressed about the efficiency - four grams of gas for 500 ml is very good, more use will see if this a constant variable. I like the compact size, as I use an Osprey Raptor 18 for biking, and it has little space - but also on backpacking trips I’m certain that I will enjoy the compactness of this stove - it is 15 cm high and 11 cm in diameter. Besides some nitpicking I can’t find any serious negative with the burner itself - the price of ~150€ is high, but then you get a great piece of kit. Looking further than the Sol Ti, I would wish to see efforts from Jetboil in the sustainability department - Jetboil can start easy by becoming a 1% For The Planet member, get a Environmental Management System in place and if they wanna go the extra mile consider Cradle-to-Cradle aspects in the design of its products. More photos if you want to see some different angles as the one shown here. Get yours at Bergfreunde, Bergzeit, Backcountry.com, CampSaver.com or REI.com.